Educator-astronaut Barbara Morgan will visit the International Space Station in 2003. Listen to this story via streaming audio, a downloadable file, or get help. 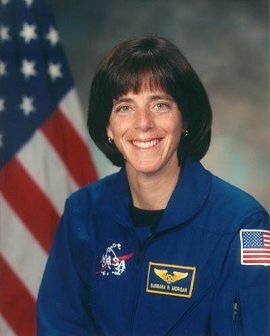 December 12, 2002: NASA Administrator Sean O'Keefe today announced that Barbara Morgan, the agency's first Educator Astronaut, has been assigned as a crewmember on a November 2003 Space Shuttle mission to the International Space Station. Today's announcement was highlighted with a ceremony at the Maryland Science Center in Baltimore and fulfills the Administrator's commitment earlier this year to send an educator into space in a renewed mission to inspire a new generation of explorers. Morgan's flight represents the first of what is expected to be many flights as part of a new Educator Astronaut program, which will be unveiled in early 2003. "NASA has a responsibility to cultivate a new generation of scientists and engineers," said Administrator O'Keefe. "Education has always been a part of NASA's mission, but we have renewed our commitment to get students excited about science and mathematics. The Educator Astronaut program will use our unique position in space to help advance our nation's education goals," he explained. Morgan's assigned mission, STS-118, has two primary objectives: the installation of additional truss segments that will increase power and communications to the International Space Station and the delivery of additional supplies for the Station's crew. Morgan will participate in a number of educational events from space and be actively involved in the flight as a fully trained NASA astronaut. A native of McCall, Idaho, Morgan was selected in 1985 as the backup candidate for the Teacher in Space program. Following the Challenger accident, the program was suspended and Morgan worked with NASA's Education Office, meeting with teachers and students across the country to share her space training experiences and their relevance to the classroom and America's future. In the fall of 1986 Morgan returned to teaching at McCall-Donnelly Elementary School in Idaho, but continued to travel the country in support of NASA's education efforts. In January 1998, she was selected by NASA to complete her astronaut training. For more than a year, Morgan has served as a spacecraft communicator, or CAPCOM, in Mission Control at NASA's Johnson Space Center in Houston, providing the voice link between the flight control team and crews orbiting in space. "Barbara's commitment and dedication to education is an inspiration to teachers across the country," concluded Administrator O'Keefe. "She embodies the spirit and desire of this agency to get students excited about space again, and I'm pleased that she'll be able to fulfill that mission from orbit aboard the Space Shuttle and the International Space Station," he said. The crew of shuttle mission STS-118: Commander Scott J. Kelly (Cmdr., USN) will lead the six-member STS-118 crew. Charles O. Hobaugh (Lt. Col., USMC) serves as the Space Shuttle's pilot. Veteran NASA astronaut Dr. Scott E. Parazynski will be making his fifth space flight. The Canadian Space Agency's Dr. David R. Williams will return to space for a second time, and Lisa M. Nowak (Cmdr., USN) will -- like Morgan -- make her first flight into space.